Forty of Ontario’s finest young choral singers have been chosen to form the prestigious 2018 Ontario Youth Choir (OYC), a program of Choirs Ontario. Every year, singers between the ages of 16 and 23 are auditioned across the province to form this exceptional group and create a wonderful experience for the singers, audiences and communities they perform in. Established in 1971, the program serves as a unique opportunity for young singers to develop their choral skills under the direction of some of Canada’s outstanding choral leaders. 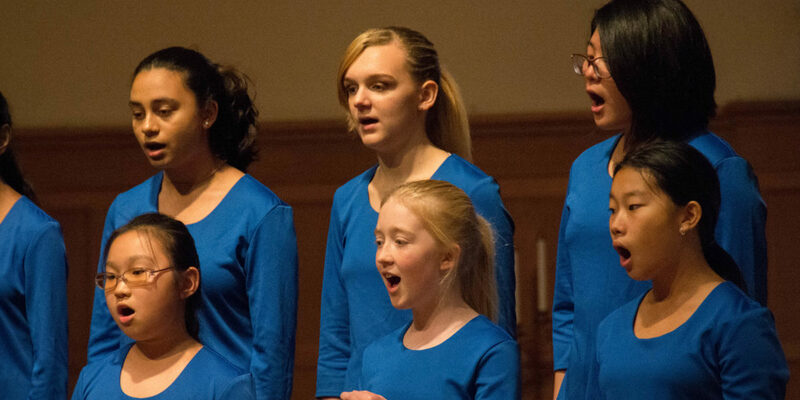 OYC offers a rare bridge from school choirs to professional choirs and serves to inspire young choristers to continue to pursue the choral arts. 2018 edition – The choir meets on August 10th at the University of Toronto for a week of challenging rehearsals and choral training, followed by a tour of three concerts. The 2018 choir is led by guest conductor Jon Washburn. Mr. Washburn is the longtime Conductor and Artistic Director of the Vancouver Chamber Choir. He is well known internationally for his mastery of choral technique and interpretation and travels widely as guest conductor, lecturer and clinician. The recipient of many awards, Jon Washburn is recognized for innovative and entrepreneurial spirit in the development of a professional choral art. Concert program – The choir will perform “The Spirit of Singing!” a concert program including an eclectic range of repertoire, from musical giants like Beethoven, Mozart, Brahms, Britten, Fauré and Bernstein to young Canadian composers of today and tomorrow. The spirit of singing and the spirit of youth are very similar – both, in fact, are irrepressible. This is sure to make for some excellent and exciting music-making. Training tomorrow’s leaders – Singers are provided with the rare opportunity to receive training from Canada’s best in the choral industry. Young choristers are inspired to pursue artistic excellence, and take these skills back to their own towns, sharing their passion for choral singing and providing better leadership within their communities. Indirectly, other youth are inspired to join choirs and experience the life-long involvement that choral singing provides. The Ontario Youth Choir is a signature program of Choirs Ontario, provincial service organization for the choral community. For more information, please visit www.choirsontario.org. For interviews, please contact Elena Koneva, Managing Director through our website or 416-923-1144.